On Sept. 11, DartFrog Books selected "Bless the Skies" by Julie Elise Landry for distribution to independent booksellers nationwide. DartFrog evaluates self-published books to ensure they meet the standards required by bookstores, then promotes and distributes its selected books to its network of partners. "DartFrog's motto is 'Anyone can self-publish, but only the best can become DartFrog books.' And they've named 'Bless the Skies' a DartFrog Book of Distinction," Landry said. "Thanks to their confidence, more readers will be able to find this story." Every book submitted to DartFrog undergoes a rigorous evaluation. Reviewers examine the book's binding, artwork, formatting, font choice, pacing, editing, and storytelling. According to a DartFrog reviewer, "Landry's world is vivid with a clear hierarchy and system of government. Her female characters are strong, smart, and brave... The pacing is excellent—there is a lot of action and suspense to keep the reader's attention. (The main characters) complement each other well. They are on the fringes of society, and the underbelly of Landry's world is evocative." A native of New Orleans, Louisiana, Landry self-published her debut novel in November 2015. She earned a Master of Arts in English from the University of Louisiana at Monroe, and she works in communications. ​"Bless the Skies" follows Laeli Tavens, a skilled thief and murderer who must rescue her little sister Elaina from a sadistic nobleman. Throughout the journey, Laeli clings to a well-crafted denial of her past, while Elaina copes with brutalities and tortures she cannot understand. ​For more information or to purchase "Bless the Skies," visit blesstheskies.com. Comic book mini-series offers modern, Southern Gothic take on "Beowulf"
In Winter 2017, independent comic writer Jake Nickens will publish "Lost Stories," a comic book mini-series offering a modern, Southern Gothic take on the three-part epic of "Beowulf." Nickens said, "The tale of Beowulf’s quest for heroism is as old as the English language. Though many details have been lost—including the writer’s identity—we remember the legend of the young warrior battling monsters to save his people. The thread of his myth endures, fundamentally woven into the fabric of Western storytelling." Nickens pulled on Beowulf’s thread and followed it from sixth-century Scandinavia to the rural town of Opossum Trot, Mississippi. 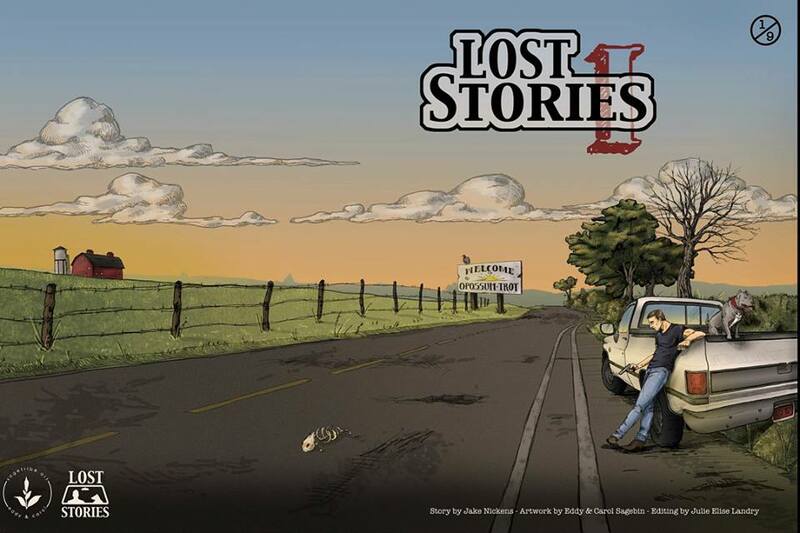 Tyson Drake, an amnesiac drifter, wanders the rural South, fighting the figurative and all-too-real monsters that populate the frayed edges of the map. Aiding him on his journey is Evie, a loveable Pitbull with a healthy dose of attitude. As Tyson uncovers the stories of those lost and forgotten, the truth of his own dark history threatens to destroy the man he seeks to become. When Tyson arrives in Opossum Trot, he unknowingly enters a colorful and dangerous world, where hospitality might mean bare-knuckle brawls or southern cooking—a tenuous realm populated by rhinestone gangster cowboys, serial killers in basement mazes, rural health food stores and at least one dragon. ​The first issue of the nine-issue series will be available for purchase in Winter 2017. Eddy and Carol Sagebin of SageTribe Art are illustrating Nickens's story. ​Julie Elise Landry, author of "Bless the Skies," will serve as editor. 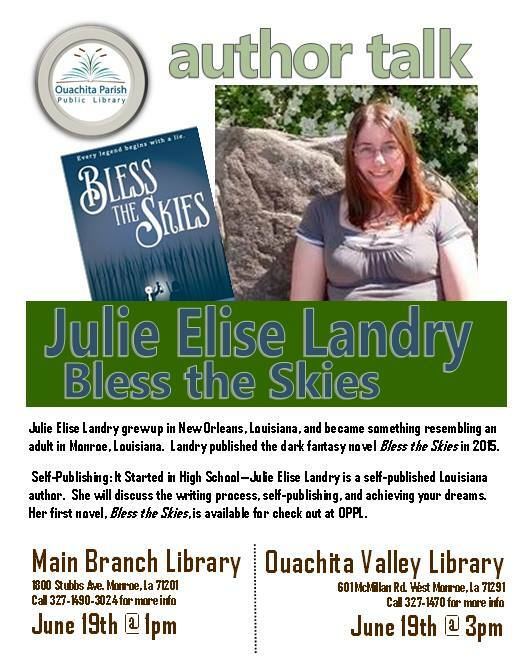 Julie Elise Landry, author of the dark fantasy novel "Bless the Skies," will present on writing and the self-publishing process to groups of teenagers at the Ouachita Parish Public Library (OPPL) on Monday, June 19. Her presentation "Self-Publishing: It Started in High School" will focus on the writing process, self-publishing and methods for remaining motivated as a young writer. Teenagers between the ages of 13 and 18 are invited to attend. Landry will speak twice: once at the Main Branch at 1 p.m. and again at the Ouachita Valley Branch at 3 p.m.
​"I'm thrilled for this opportunity," Landry said. "Writing became a full-fledged passion for me as an eighth-grader, and I wrote the primordial draft of 'Bless the Skies' when I was 14. I want this audience to understand—they can start writing now, as soon as they decide to start." A New Orleans native, Landry relocated to Monroe in Ouachita Parish in 2007 to attend the University of Louisiana at Monroe. She earned a Bachelor of Arts in English and Spanish in 2011 then a Master of Arts in English in 2013. After graduating, Landry reported on crime and safety for The News-Star in Monroe. She self-published her first novel in 2015 after returning home to New Orleans. The Electronic Publishing Industry Coalition (EPIC) named "Bless the Skies" a finalist in the 2017 EPIC eBook Awards Competition. The winners of the competition will be announced by the end of June. ​"Bless the Skies" is currently available for checkout at OPPL. For more information, call the OPPL Main Branch at (318) 327-1490 or the OPPL Ouachita Valley Branch at (318) 327-1470. On March 9, the Electronic Publishing Industry Coalition (EPIC) named "Bless the Skies" by Julie Elise Landry a finalist in the 2017 EPIC eBook Awards Competition. The winners of the competition will be announced later this year. "Bless the Skies" competed in the fantasy/paranormal category and survived two rounds of judging. ​As a finalist, Landry's book is one of the top three fantasy/paranormal e-books entered into the contest. ​EPIC judges include e-publishing industry professionals and members of the EPIC community. In the preliminary round, books are evaluated and scored based on the first three chapters alone. In the next round, judges read the entirety of the books and assign additional scores. After three or four finalists are announced for each of the 17 genre categories, the final round of judging determines the winners. Only 10 self-published books were named finalists, and "Bless the Skies" is the only self-published finalist in its category. EPIC presents winning authors with commemorative trophies. Landry said, "I'm excited—terribly honored and excited. If I cross my fingers any tighter waiting to hear the final results, I'll cut off all circulation!"